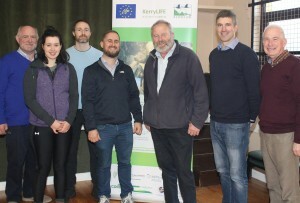 and KerryLIFE, an EU co-funded project based in the Caragh and Kerry Blackwater catchments, is working with local farmers, the Ring of Kerry Quality Lamb Group and South Kerry Development Partnership on a new sustainable beef production approach in Kerry. The programme seeks to ensure that Bord Bia quality assured KerryLIFE farms have the opportunity to develop and deliver quality meat products to catering and retail customers in the Kerry area. The marketing and distribution activity is led by Ring of Kerry Quality Lamb director Denis Carroll. Two Hereford animals belonging to George O’Neill Blackwater were used in the beef tasting dishes prepared by Executive Chef John Casey. The animals were fully Quality Assured by Bord Bia’s National Quality Assurance Scheme & KerryLife. Executive Chef John Casey prepared a wonderful selection of beef dishes for an initial tasting of the KerryLIFE beef products in the community centre in Glencar in November. This tasting was attended by a KerryLIFE farmers and potential customers and the consensus was that the meat quality was exceptional. KerryLIFE is a €5 million EU co-funded LIFE demonstration project to support restoration of the critically endangered freshwater pearl mussel. The project works closely with the farmers and forest owners in the Caragh and Blackwater river catchments and is based in Glencar Community Centre Shanacashel, Glencar Co. Kerry.